Today is World Galgo Day. Galgos or Spanish Greyhounds are gentle sighthounds who are used by ‘galgueros’ (hunters) in Spain during the hunting season which ends on 1st February. The number of galgos who are well cared for by their galgueros remains small. The majority of galgos are poorly treated during the hunting season and will be abandoned or killed as soon as the season is over. A number of concerned and kind-hearted souls have begun to bring light into this shadow. They have created shelters where abandoned galgos can be cared for and rehomed into loving homes. They put pressure on governments to protect the galgos and have them recognised as sentient beings. When people come together in love and kindness miracles can happen. 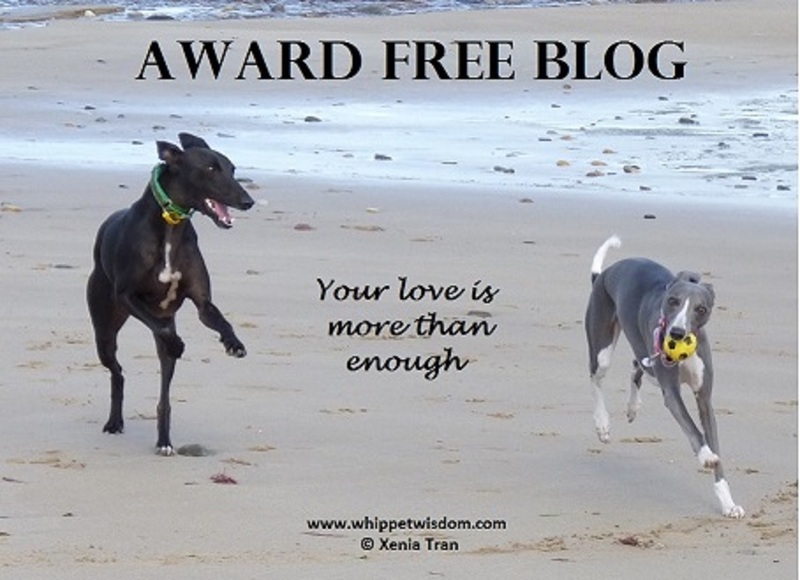 We pray that all galgos will be able to enjoy the kind of blessings that have come our way. Camera: Panasonic Lumix FZ200, setting: iA, 1/500 s.
The campaign by Pet Levrieri resulted in the successful ban of greyhound and galgo racing in Argentina and they are now working towards similar bans in Chile and Uruguay. You can read their inspirational story when you follow the link. Galgos del Sol is a galgo rescue organisation based in Spain that currently rehomes galgos in the UK, USA, Belgium, The Netherlands, Czech Republic and Slovakia. Greyhounds in Need (GIN) is a UK-based charity that supports galgo charities in Spain with veterinary care, blankets and coats for the dogs, renovation of shelter spaces, transport and education programmes. They rehome greyhounds and galgos in the UK and the rest of Europe. Please note that if you Google ‘galgos’ or ‘world galgo day’ you may find some of the images you see very distressing. I am seven years old and stand on the shores of Lake Siljan in Dalarna, Sweden, with my first camera strapped around my neck. It is my first holiday abroad and I immediately feel at home among the trees, mountains and fresh water lakes. My camera has two settings, ‘sunny’ and ‘cloudy’. Although there are a lot of clouds in the sky, I decide on ‘sunny’ and take the picture you see above on the right. When I look at these images today I realise that no matter how cloudy the world and skies around me become, I always focus on the light. That first experience of spending time in nature made a lasting impression. Forty seven years later I am living in a place with fresh water lakes, mountains and forests where I capture the beauty around me with a camera strapped around my neck. Camera (Eivor and Pearl at Loch Laggan): Panasonic Lumix FZ38, setting: iA. Photograph of me as a seven year old girl taken by M Koning. In this week’s Discover Challenge we are invited to post about a place that means something special to us and we can interpret this any way we wish. This challenge coincides with my completion of ‘Carpe Diem Haiku First Winter Retreat 2016 – Find the Silence’ where we were invited to find the silence and create haiku, haiga or tanka every day for thirty days. This is a beautiful time of year to write about silence and connect with that calm place within ourselves. More than half of my daily writings on ‘Finding the Silence’ were posted on twitter and I am sharing some of them here to show the many moments that inspired me to find the silence both outside and inside of myself. The haiku below were previously posted on twitter and made me reflect more deeply. I added prose and created a double haibun for the blog in Frozen Footsteps. One fellow blogger commented that I am carrying the silence with me. It feels that way and I believe the accumulative effect of focusing on silence every day AND writing about it helps you to carry the silence from one day to the next. Fellow blogger Mark Aldrich has written many posts about Egyptian photo-journalist Mahmoud Abu Zeid, also known as Shawkan. He has been held in prison without charge for more than three years and he misses the sky. On ciluna27’s Blog you can read more background information about the #SkyforShawkan initiative that was created on twitter where fellow photographers can post photographs of the sky for Shawkan. After posting several photographs of the sky at #SkyforShawkan I found silence here too. Silence in the beauty of the many photographs posted here, silence in the invisible space where people who care about human rights come together. I began to create haiga in aid of the campaign for Shawkan’s release and some of them took me to a completely different dimension of silence. One year later Shawkan is still in prison. I have created more haiga for the campaign and shared them on twitter. ciluna’s27 blog created a new and beautiful post on 12th December 2017 featuring many new photographs for the #SkyforShawkan campaign which include five of these haiga. You can read this post and see the images here. Silence was to be found in so many places, including indoors. Camera: Lumix Panasonic FZ38, settings: Landscape and iA. Camera: Lumix Panasonic FZ38, settings: Indoor Scene and Landscape. As the tide flows out to sea the sandbar feels soft and forgiving. My heart leaps before I do and all sound disappears while I sprint away on a cloud. When we run for fun there flows a deep understanding between us. In a sweeping curve we return to our companions and our hearts leap once more before we do. Discover Challenge: One, Two, Three! We are walking through the forest to shelter from the arctic wind. Light rain and wet snow soften the earth and give the golden leaves some extra sparkle. It has been a while since we included a music video and today we heard a few people singing this song and thought it would be nice to include an old clip where the original band perform it live. The song is called ‘Chi Mi’n Geamhradh’ (I see Winter) and it is performed by Runrig, a band originally from the Isle of Skye. We are walking through the glen of a thousand whispers and the leaves rustle in the breeze. Their colours have begun the change and the rains have filled the loch. I love the smells of Autumn, the smells of the here and now. We live in the moment, always. We have been teaching our companions to do the same and they like to follow our example. After climbing for a while we reach a clearing where we can see over Loch Beinn a’Mheadhoin. Camera: Lumix Panasonic FZ38, settings: Outdoor Action and Landscape.